One of the wonderful things about living in Ghana is that Ghanaians, like other people of Afrikan descent, are food loving people. 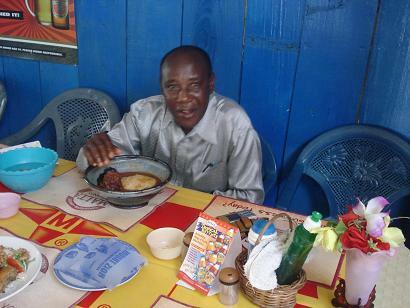 The mere sight of a Ghanaian enjoying a meal could tempt any stanch anorexic to promptly regain her appetite. Those who know me also know I would feel right at home in such a setting. I have three passions: food, conscious reggae and reading. The last two are interchangeable in position but my love for food never wavers from the top of this list. And thankfully, Ghana’s culture fully indulgences my food passion. 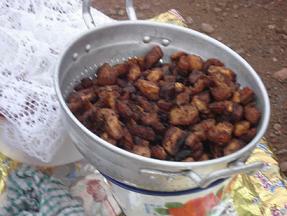 Another wonderful thing about Ghana accommodating my love of food is that Ghanaian traditional dishes are very familiar. Plantain—which form? Boiled, roasted and eaten with groundnuts (peanuts) or fried with pepper and ginger (kale wale)? Breadnut, pear, tania, dasheen—the stewed leaf or the tuber? Yam— whether fried and served with pepper sauce, roasted, boiled or pounded into fufu, you name the Antillean food and it’s here. That also goes for Antilleans’ appreciation for the burnt bottom of a pot of rice as a delicacy but if you’re looking for green fig (banana) salad you will not find it in Ghana. Ghanaians do not eat green banana in any form; they regard it as poor peoples’ food (this should make you rethink the West’s concept of the perpetual starving Afrikan). The Ghanaian aversion to green bananas was made painfully clear to me during a serious bout of fig withdrawal on my first visit to the country in 2000. Unfortunately, during the two weeks of my frantic preparation for the trip I had no time to make my weekly visit to the West Indian grocery store in Toronto for my usual shopping for green bananas. Within the first week of being in Ghana I began having cravings for my favourite food but no one would entertain my idea of stalking a ripe banana seller for directions to her green banana supply. Boiled green or ripe plantain yes, but for banana I was told to head to Rwanda or Uganda where they appreciate green bananas in a pot. But once in awhile someone takes pity on me and gives me a rare green banana treat. I’ve been in the country for almost a year and have only been blessed with the dish three times while ripe bananas are forever at my disposal. Kale wale - fried plantains and pepper and ginger. In the absence of fig I learned to do with my newly discovered other favourite food, fufu, which like fig I could happily eat three times a day (and if someone invented a good fufu dessert I’d gladly have it too). Fufu is made from boiled yam or cassava, a combination of the two or either of them mixed with another starchy food such as plantain or tania, which here they call coco yam. The chosen provision(s) is pounded in a mortar with water into a dough of a variation of hard or soft consistency. The finished product, which reminds me of the bois-pain pele (pounded breadfruit) our grandparents used to have to accommodate for their missing teeth, is formed into a well-portioned ball and served with groundnut soup or light soup (fish or meat). I prefer my fufu with smoked fish and groundnut soup. The ultimate pleasure of eating this meal, like all other Ghanaian traditional dish, is that it’s eaten with the bare hand and not attacked with a knife and fork. After all, the end of every good meal should be punctuated with the licking of the fingers. But the novice fufu eater must practice patience and allow due time to pass before indulging in the dish or she’s sure to end up with blistered fingers from the soup that is always served piping hot. Ghanaians are quite particular when it comes to deviating from the food they combine into a meal. For instance, on a visit to my favourite chop bar (street corner restaurant), I was asked for my order; naturally it was fufu with groundnut soup. Unfortunately, the waitress informed me, the soup was not yet ready. I told her that was not a problem. I would have fufu with roasted fish and pepper. 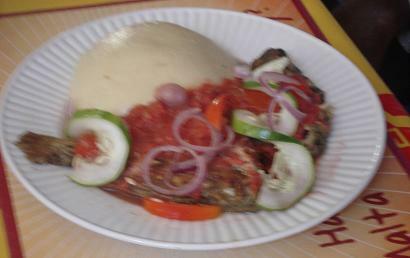 Fufu with roasted fish and pepper. “Oh no,” she said with a slight look of horror. “Fufu is supposed to be eaten with soup. You can have the fish with banku (cassava dough) or kenkey (maize dough); either one is available.” And the same goes for okra soup; it’s eaten with only banku or akple (another form of maize dough) or any deviation and one might think you’re deranged. One evening while I prepared my light dinner of canned sardine with crackers and pepper at a girlfriend’s house, her son liked at me as though I’d lost my mind. Sardine, according to Yaw, was to be eaten with banku, kenkey or garre (farine). I invited him to sample what I thought was an excellent combination; Yaw politely refused and proceeded to prepare his dinner of kenkey with fried fish and pepper. I wonder how it came to be that in the Antilles we have no compunction combining any foods into a meal. Is it a throw back to Slavery when limited access to food made any food combination palatable, such as sous (stewed pig feet and cucumber)? By the way, with much pleading I was eventually served my requested meal at the restaurant where the waitress thought I committed a faux pas by asking for fufu with roasted fish and pepper. But the Ghanaian propensity for being fascinated by my eating doesn’t stop here. Whenever I devour my Ghanaian food with the usual gusto Ghanaians always seem amazed I not only enjoy their food but that I actually know the ingredients of whatever I’m eating. Of course, this reaffirms the schism that slavery has created among people of Afrikan descent on the continent and those from the Antilles. Regardless of the numerous times I explain to these same people that there is little difference between what’s cooked in pots of West Afrika is little different than that cooked in the Antilles they always seem on the verge of grabbing the pepper and acara (or any peppery food) from me to avoid me scorching my “virgin” palate. They obviously never saw me demolish my late Ton (uncle) Ato’s inferno black pudding. Acara (gawu, as it’s known in the Ewe language in Ghana—Ghana has over 100 languages), is also made in other West Afrikan countries such as Mali, Senegal and Nigeria. It’s our version of ackra (cod fritters) in the Antilles. It’s made from black-eye peas. The beans are soaked to enable easy removal of the skin and grinded. Onion, salt and spices are added to the bean flour along with water. The moderately liquid mixture is fried into slightly round fritters and usually served hot with pepper sauce. One afternoon I had a graving for acara but was unfortunately told I would have to wait for the morning to satisfy it since that was the time acara is typically sold. I first discovered the West Afrikan fritter at an Afrikan musical festival in Toronto a few years ago. Immediately after tasting it from a friend vendor I promptly pulled a chair and sat directly beside where she was frying the fritters. I didn’t move from there until I almost became close to getting sick from overeating the oily food. Aside from loving food I’m addicted to pepper and acara nicely satisfies this addiction. Ghanaians fascination with my eating can be amusing. After satisfactorily licking my lips over my coco (maize porridge, which remains me of kwenm toloman—arrow root porridge) they look at me with a perplexed look as if to ask, “Didn’t you say you’re not Ghanaian?” But their eyebrows do go up when I grab some leaves off an orange tree to make dite lujet (citrus tea) or bring out my cocoa stick (directly from St. Lucia) to grate for my dite kaco (cocoa tea). Although Ghana is renowned for producing the world’s best cocoa Ghanaians have yet to learn the art of making the cocoa stick; it’s just not the same spooning cocoa powder from a can to make a nice pot of dite kaco, as pure as the cocoa powder might me. But I forgive them the slight ‘deficiency’ since cocoa production was never intended for Ghanaian consumption but instead to satisfy the colonial British palates but also, Ghanaians have cultivated an ear for good music; wherever I travel in Ghana I’m sure to hear good conscious reggae blaring from a speaker (there’s no other way to play it). And after all, being able to satisfy two out of my three passions in a country that I’m not native to is not bad at all.